Air Niugini’s inhouse C checks or heavy maintenance checks on its jet aircraft at the airline’s engineering hangar in Port Moresby is nearing completion, a result of great team work that is saving Air Niugini millions of kina. Two heavy maintenance “checks” are being carried out at the moment, one on Fokker 70 aircraft, P2-ANR which commenced in July this year and is on target to be completed by October and the other on Fokker 100, P2-ANU expected to be completed by the end of November. P2-ANR is the first ever Fokker 70 check being carried out in-house. Air Niugini’s Licensed Aircraft Maintenance Engineer (LAME) in charge of Heavy Maintenance, Richard Woolcock said the team involved in the project appreciates the trust and confidence that has been placed on them by Air Niugini to get the C checks done on shore. A ‘C’ Check is the most in depth type of maintenance that can be carried out on an aircraft. Basically, engineers take off every part fitted to the aircraft, inspect both the removed parts and the aircraft for damage, wear , corrosion and general condition then either repair in house or get new parts. When the aircraft leaves the hangar at the end of its check, engineers ensure it near to “As New” as possible so that the aircraft can keep flying and passenger safety is guaranteed. 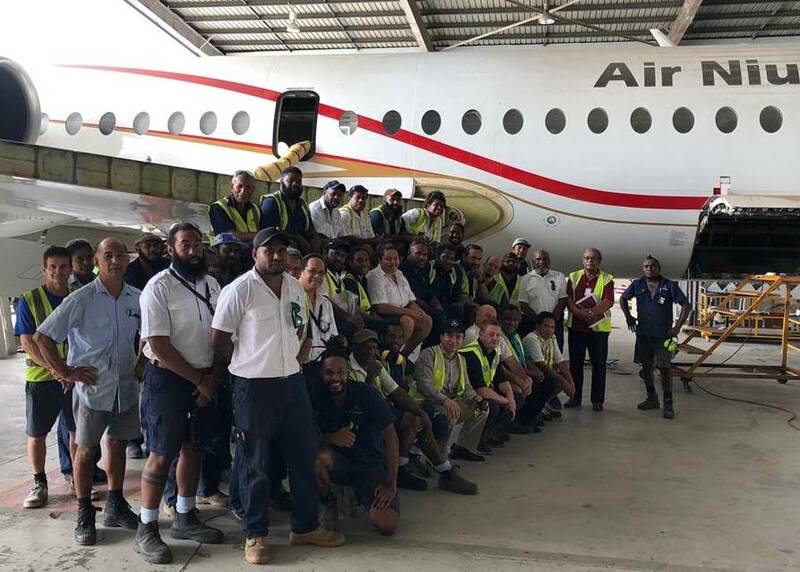 Acting Chief Executive Officer, Mr Tahawar Durrani said another two Fokker aircraft are in the plan to be worked on this year, adding that as the maintenance staff experience grows so the time taken to complete each check can be reduced but maintaining the high work standards that are expected by Air Niugini. He also said other operators of Dash 8 in the region are showing interest in what Air Niugini is doing. The in-house C checks arrangement is saving Air Niugini K2.5million each time an aircraft goes in for heavy maintenance. Previously the aircraft had to be sent overseas for such maintenance, which is very expensive for Air Niugini and the country.